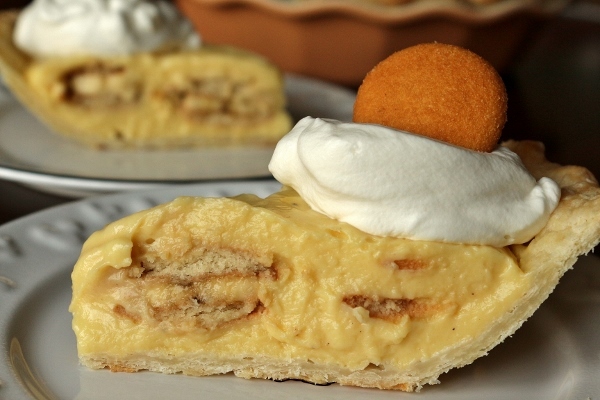 When I first made this Banana Nilla Pudding Pie, I hadn't planned on sharing it on Mission: Food. I've been posting a lot of pie recipes because of my resolution to bake more pies (at least one per month), so I figured I'd just skip this one. Turns out, this pie was so delicious I ended up making it twice in the span of a couple weeks! That's never happened before, even with my other favorite pies. 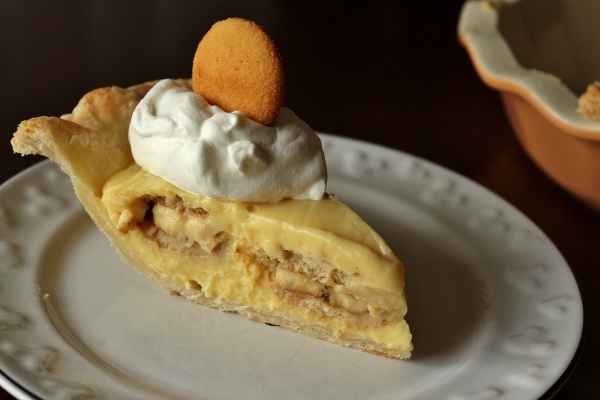 I figured it would be tragic if I kept it from my readers, so here's another pie recipe! I have a good excuse to post this today of all days. Today is my birthday. I'm actually spending it at Walt Disney World, the absolute best place on Earth to celebrate birthdays. Although cakes usually stand in as the birthday dessert of choice, I prefer birthday pies hands down. In fact over the past year and a half every member of my family has gotten a pie for their birthday instead of cake, and no one has complained. 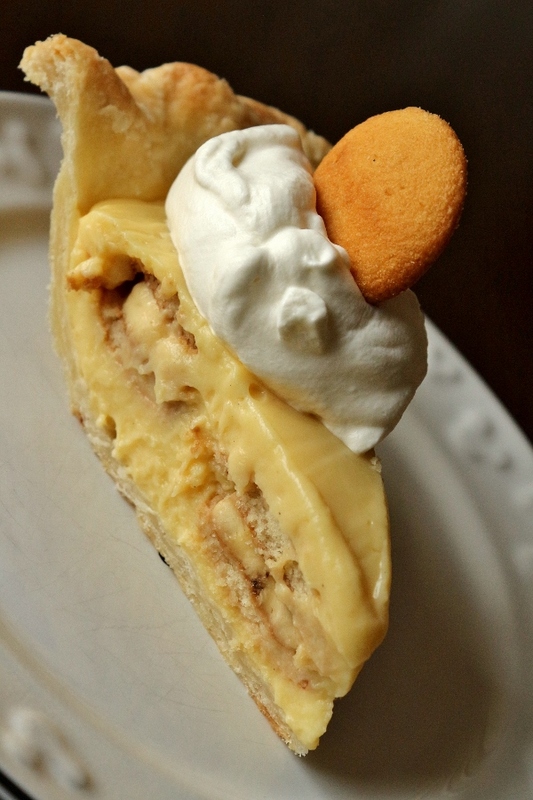 This particular pie takes two beloved desserts and essentially smushes them together. 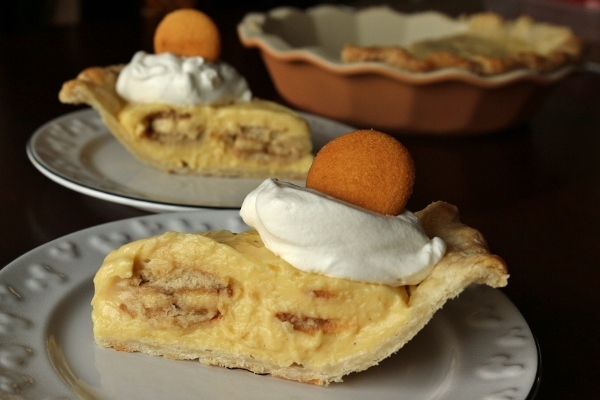 You have your banana pudding with softened Nilla cookies layered within, and of course your classic banana cream pie with pastry cream and freshly whipped cream piled atop sliced bananas, all held together with a flaky pie crust. 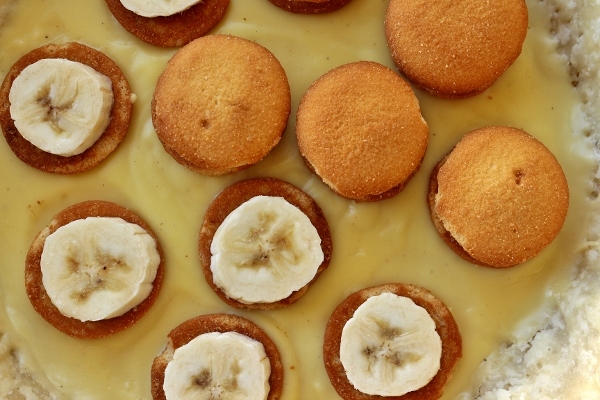 Marry the two and the result in a golden crust filled with banana pudding, and a layer of Nilla cookie and banana sandwiches. 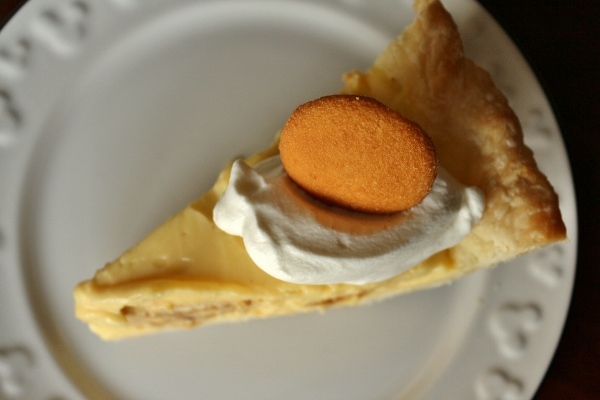 Each slice is served with a dollop of lightly sweetened whipped cream, and a crisp Nilla cookie for garnish. Oh my, this pie is serious business. It's creamy, decadent, and yet not too sweet or rich. The banana flavor is just right. Instead of the usual McCormick banana extract which contains yellow dye, and according to many reviewers has a very artificial banana flavor, I purchased a more natural, dye-free and alcohol-free banana flavor that has rave reviews. You definitely don't need the yellow dye, as the pudding naturally gets a yellow hue from the egg yolks. This pie is birthday worthy, that's for sure. Lightly flour a smooth work surface and a rolling pin. Take a chilled disk of dough out of the fridge. Give it a couple of firm squeezes just to say hello, then unwrap it and set it on the floured work surface. Set the pin crosswise on the dough and press down firmly, making a nice deep channel across the full width of the disk. Turn the disk 180 degrees and repeat, making a second indentation, forming a plus sign. Use your rolling pin to press down each of the wedges, turning the dough 45 degrees each time. This will give you the beginnings of a thick circle. Now, rolling from the center outward and rotating the dough a quarter turn to maintain a circular shape, roll the dough out to a 13-inch circle with an even thickness of 1/4 inch. Set your 9-inch (23-cm) pie pan alongside the circle of dough. Brush off any loose flour, carefully fold the dough circle in half, transfer it to the pan, and unfold. At this point, the dough will be lying across rather than fitted into the pan. Now, without stretching the dough, set the dough down into the pan so that it is flush up against the sides and bottom. The best way to do this is to gingerly lift the dough and gently shift it around so that it settles into the pan bit by bit. Use a very light touch to help cozy it in. To flute the edge, fold the overhang under to form a 1-inch wall that rests on the lip of the pan with the seam slightly below the pan's top edge. Flute the edge of the crust at about 1-inch intervals, pressing from the inside with the knuckle of your index finger while supporting on the outside with the thumb and index fingers of your opposite hand. Transfer the crust to the refrigerator to chill while you make your filling or to the freezer to prepare it for prebaking. Alternatively, at this point the crust can be covered tightly in plastic wrap and refrigerated for up to 3 days or double-wrapped and frozen for up to 2 months (defrost overnight in the refrigerator before filling and baking or prebaking, or at room temperature for 30 minutes). 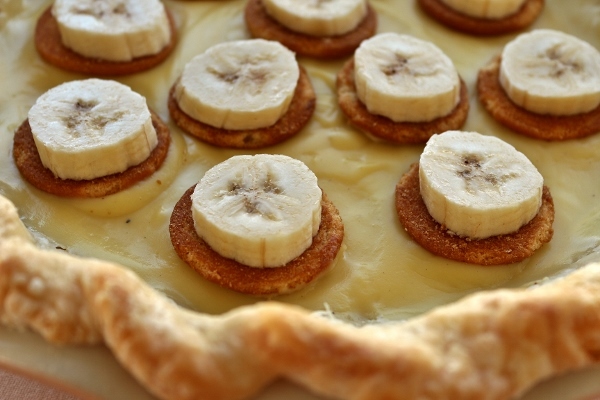 To prebake the shell, chill the panned, fluted piecrust in the freezer until firm, 15 to 20 minutes. Preheat the oven to 375 degrees F with the rack in the center. Line a rimmed baking sheet with parchment paper or foil. 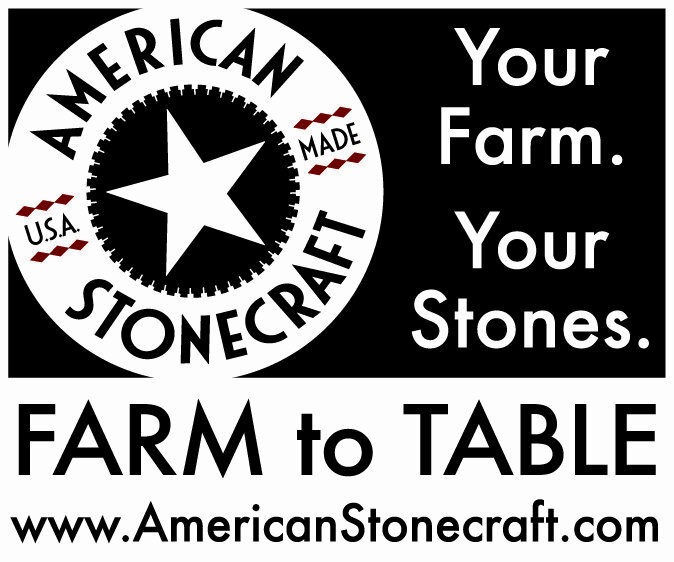 Cut an additional 13x13-inch square of parchment. Set the pan on the lined baking sheet. Set the square of parchment in the pie shell and gently smooth it into place, pleating as needed to fit it up against the bottom and sides of the shell. The edges of the paper will project beyond the rim of the pan; just leave them standing straight up. Fill the shell to the top with dried beans. Slide the baking sheet into the oven and bake the shell for 25 minutes. Set out a wire rack and alongside it, a mixing bowl. Take the baking sheet out of the oven and set it on the rack; bring together the points of the parchment, and carefully lift out the beans and transfer them to the bowl. Slide the baking sheet back into the oven and bake the crust another 10 minutes (until golden brown and fully baked--mine baked twice as long, an extra 20 minutes until the bottom of the crust was light golden). Cool completely on a wire rack. To make the filling, combine the evaporated milk and whole milk in a medium saucepan and cook over medium heat, stirring occasionally, until steaming. Keep warm over very low heat. Combine the sugar, cornstarch, salt, and nutmeg in a medium bowl and whisk together. Add the egg yolks and whisk until the mixture is smooth and pale. Immediately measure out 1 cup of the hot milk mixture and slowly add it to the yolk mixture, pouring in a thin stream and whisking constantly until combined. Turn the heat under the saucepan back up to medium. Slowly add the tempered yolks to the saucepan, pouring in a thin stream and whisking constantly over medium heat. Continue cooking, whisking constantly, until the mixture thickens to a pudding consistency and a few large bubbles rise to the surface, 5 to 7 minutes. Once the bubbles appear, continue cooking the pudding, whisking constantly, for 2 more minutes. Remove the saucepan from the heat and whisk in the butter, rum, vanilla, and banana extract, whisking until smooth. Set the pudding aside to cool for 5 minutes. To assemble the pie, spoon half of the filling into the prepared shell and top with a single layer of 11 wafers, flat-sides up. Top each wafer with a banana slice, followed by another wafer flat-side down. Gently press the cookie sandwiches down into the filling. Spoon the remaining pudding into the pie shell and smooth the top. Cover with plastic wrap, pressing onto the surface of the pudding, and chill overnight (at least 12 hours or up to 3 days) before slicing and serving. 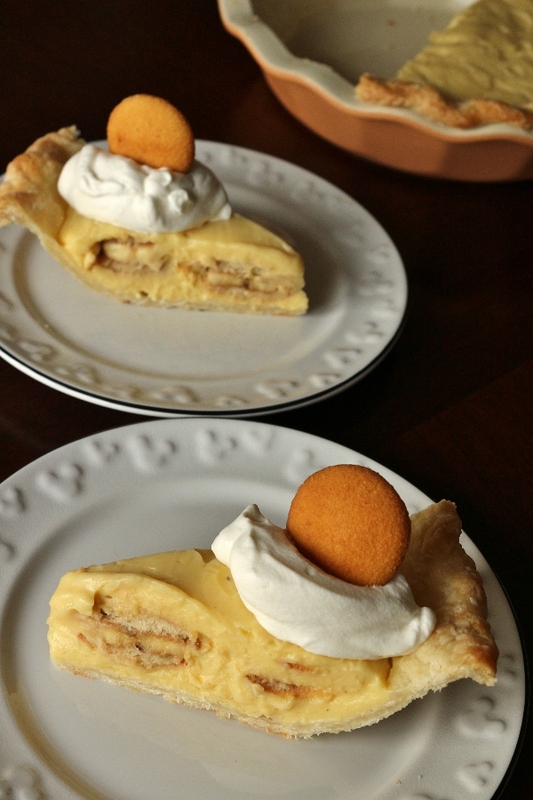 Serve cold, with whipped cream and a Nilla Wafer.